Three weeks ago today I left Springer. I think it’s a good time to reflect on what’s made the journey so special so far. Most of my big hiking endeavors have been completed alone. When the long days, cold mornings, and rainy night hit me hard, I relied on myself to keep moving. I still have that same drive to finish the AT, but there is another factor in play on this hike: people. The people I am hiking with (I hike with sometimes and sometimes we just meet up a few times throughout the day and at camp) help me keep going. 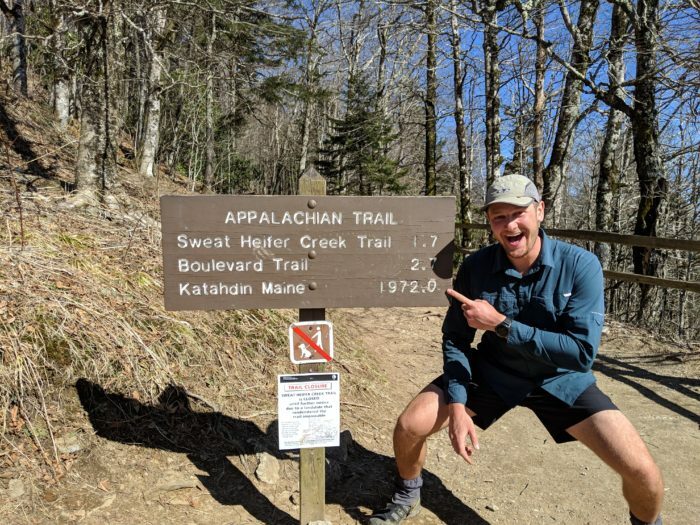 It’s easy to get caught up in the fact that the trail still stretches nearly 2,000 miles in front of me, but when I’m laughing and chatting at camp at the end of the day, I have no worries. Our small group has gotten into the routine of going over the day by doing “rose, bud, and thorn” (high point, what you’re looking forward to, and low point). It’s all credit to Recap. He started asking us about our favorite part of the day at camp each night. Not only do I love reflecting on the day this way, I also love hearing what my friends have to say. At the end of the day, after we all hiked over the same rocks and roots, we all have a different perspective. Rose: We did the Smokies and got great weather. It was beautiful to walk through the whole park. Bud: I’m excited to go over Max Patch and walk right through Hot Springs. Thorn: A few of us found a small campsite that we have to ourselves but the whole group isn’t here for the night. Would have been great to have everyone here. The AT is long. It is shocking to think about how many miles lie ahead of me. Daily milestones help break the trail up into smaller, accomplishable tasks. Every day I think about the terrain that is in front of me. What views do I have? What mountains will I go over? Will I go into the next page of my guidebook? Keeping track of the little things that happen every day make each day a joy instead of a chore. I love hiking, so looking forward to views or big climbs gives each day a purpose. Also, as daunting as the miles seem, I’m glad to still have so many left. It means that I still have a lot left to see. 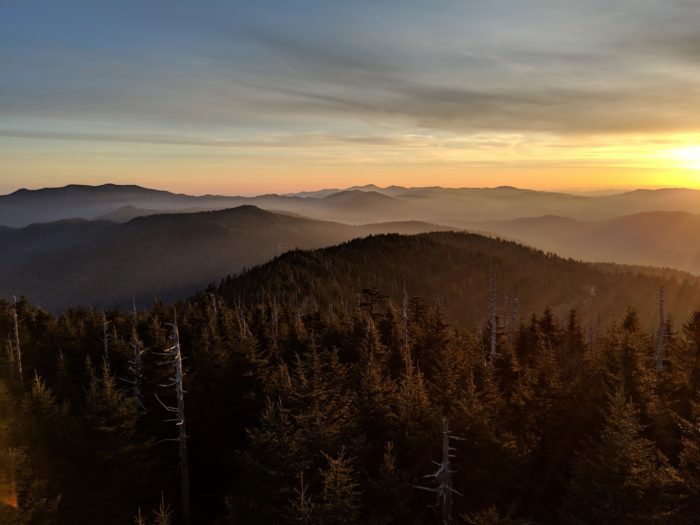 Sunrise on Clingmans Dome (tallest point on the AT). There are many aspects of hiking that are rewarding. Reaching a vista, stumbling on a waterfall, feeling my body gain strength every day. There is one thing that really puts this hike into perspective and gives me an immense feeling of satisfaction: When I reach a viewpoint on a clear day and I can see for miles, I look at the mountains that lie ahead of me and know that I’m going to walk to the horizon. When I’m winding through the trees it’s hard to comprehend the scale of the distance I’m covering. When I get to a view I get to see the big picture, and when that view faces south, I can see how far I’ve come. To sit on a mountaintop and look at how far I’ve come in one direction and how far I’m going in another is something that inspires me to keep walking. I love the “rose, bud, and thorn.” I think I’ll be adopting it!